Kobo recently released a firmware update to its other e-readers that finally supports the option to enable/remove the header and or the footer (the Kobo Forma was the first device to support the feature). It is a positive update but should've been supported before. The ability to set text layout to two columns in landscape mode is not supported in iOS. The Android application has limited font options (there are three fonts available - Droid Sans Serif, Droid Serif and the publisher's default font). There is no way to change margins and line spacing settings. No option to export annotations and highlights. No option to upload personal documents to collections to then sync to a Kobo e-reader or another device. In Kobo's iOS application you can't access the Kobo store within the application. There is a good range of open type fonts that are alternatives to paid fonts. Bitter and Glacial Indifference are two alternative open type fonts to Caecilia and Gill Sans (two paid fonts that are available on Kobo e-readers). Bitter is a slab-serif font that is similar to Caecilia and is ideal for E-Ink screens due to its thickness. Glacial Indifference, on the other hand, is a sans-serif font similar to Gill Sans. Likebook Mars Vs. Kobo Aura One: Which one is best? Screen: Both the Aura One and Likebook Mars have a 300 PPI E-Ink Carta screen. However, the Kobo Aura One's screen colour is lighter, and the text has better clarity. This is not to say the Likebook Mars's screen is bad, but the Kobo Aura One has one of the best screens I've seen on an e-reader. 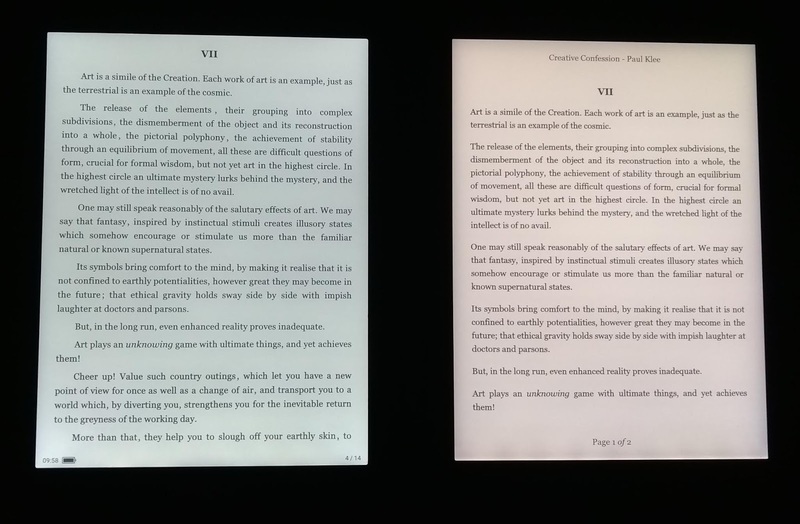 In my view, the Likebook Mars's screen is comparable to the Kobo Aura H20 Edition 2. One Likebook feature that I particularly like is the ability to change text and image contrast. This feature enhances the reading experience as text and image black levels can be altered. 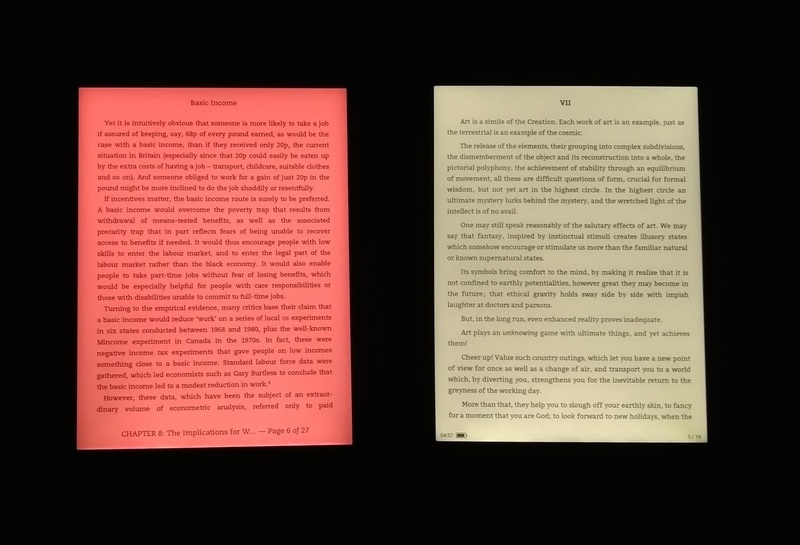 Kindle e-readers, in comparison, only support font bolding for AZW3 e-books. Battery Life: It is too early to give an opinion on the Likebook Mars's battery life. However, it is clear that the Likebook Mars should not be primarily used as an E-Ink tablet. For example, keeping the WiFi on, running Android applications and browsing the internet taxes the battery. The Likebook Mars doesn't even reach average tablet level longevity when used as something other than an e-reader. So far, based on initial impressions that can change, when used as an e-reader the battery lasts roughly two days of heavy usage. The Kobo Aura One, relative to other e-readers, has a small battery capacity but it still outlasts the Likebook Mars. Versatility: The Likebook Mars, running Android 6, is a more versatile device. The native e-reading software is not bad after you get used to its idiosyncrasies. If the native software doesn't render a PDF document to meet your needs, then there are other applications. You can install KOReader and Cool Reader on a Kobo e-reader, but you need to exit Nickel (Kobo's operating system) to access these applications. Performance: The Likebook Mars's performance is better than the Kobo Aura One. The Aura One also performs worse in comparison to the Kindle e-readers. The Likebook Mars's 2GB RAM and octa-core processor makes the device the most powerful e-reader I've used - the performance boost makes a big difference when reading and navigating PDF documents. Software: Boyue's firmware is underdeveloped and buggy. In comparison, Kobo's software is more polished, intuitive and stable. However, there are features in Boyue's native e-book reading software that Kobo neglects, e.g. the ability to export annotations, the option to change both text and image contrast in e-books and more font size options. Needless to say, Mars's PDF support is far superior to Kobo's basic PDF viewer. Front light: The Aura One's front light is better. It is warmer, more even and brighter. The Aura One's comfort light also changes colour intensity (at the maximum intensity it is an orange/red mix). The Likebook Mars night light, in comparison, has no gradation. The light is either on or off but with a similar colour tone to the Aura One's orange tint at 70% intensity. It should be noted that front lights can vary between units. Front light comparison pictures can be seen below. Expandable storage: The Likebook Mars has 16GB internal storage but, unlike the Aura One, storage is also expandable via an SD Card slot. The Aura One only supports 8GB internal storage (there is a 32GB Aura One limited edition that is not widely available). E-book formats: The Aura One native e-book format is KEPUB - a variation of the EPUB format. On paper, the Aura One supports EPUB and MOBI e-books, but I found it renders both poorly. The Likebook Mars supports both formats with no issues. The answer depends on the user's needs. If the intention is to read e-books only on a user-friendly device, then the Kobo Aura One is the better option. The software is more polished and the battery life lasts longer due to tight integration between hardware and software. If, on the other hand, the user wants an e-reader that supports e-books and also handle all sorts of PDF documents then the Likebook Mars is the better option. The Likebook Mars can handle large PDF documents easily and with no slow down. If you don't like Boyue's native PDF software, then there is the option to install KOReader and EBookDroid. Similarly, if you don't like the native e-book reading software there is the option to install, for example, Moon+ Reader, KOReader, Bookari Reader and AIReader. KOReader supports Kobo devices but you need to relatively proficient to install the software and then exit Nickel to access the application. Further, KOReader, due to Aura One's hardware, struggles to handle large PDF documents. 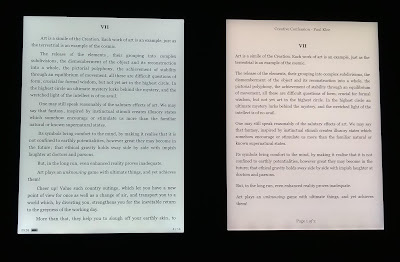 Front light comparison between Likebook Mars and Kobo Aura One. The Aura One's front light is warmer and evener. (click on the image to enlarge). Kobo Aura One's comfort light at maximum intensity. The Likebook Mars, in comparison, doesn't support the altering of light intensity (click onthe image to enlarge). Don't expect to use the device as an E-Ink tablet. With ghosting, refresh and flashing, most Android applications don't work well on an E-Ink display. The design and use of Android applications are also taxing on the battery - I found the device's battery drains quickly if used as something other than an e-reader. The native e-reader firmware isn't bad but there are bugs, strange rendering of an e-book's formatting and missing features. For example, the e-book software forces indent at the beginning of a paragraph and large spaces between sections. There is the option to change the settings but certain formatting issues cannot be changed. The translation of the interface and menus from Chinese to English (I assume this applies to other supported languages) causes confusion. For example, if you long press on an installed application there is an option to turn on 'application bleaching' but it isn't clear what 'bleaching' means (I think 'bleaching' means the clearing of E-Ink ghosting). The device's firmware is not intuitive and I couldn't find a manual to clarify how to find and use different features. The e-reader aficionado might find the discovery of different features and applications fun; however, this might not be a device for the general user that wants an e-reader that just works. The device is zippy due to the octa-core processor. I tested large PDF files and the device handled them without issue. Due to optimisation and integration, I found the native e-reading software works best but I also used KOReader when needed. I've used a Boyue e-reader before - the Boyue T80 that was re-branded by Icarus as the Illumina XL - and found the screen quality poor. The T80's resolution was relatively low but the real issue was the lack of contrast and serious problems with ghosting in third-party applications. The Likebook Mars demonstrates that Boyue e-readers are improving - the E-Ink Carta screen, in my opinion, is better than the Oasis 2 and while ghosting issues remain there are some features added that help. Amazon’s excellent software and hardware integration mean the Kindle is optimised for its purpose bottom-up. The Paperwhite 4's battery life is better than the Kindle Oasis 2 and is what you expect from an E-Ink device. This bottom-up optimisation is absent with Android e-readers and this affects not only battery life but also general user-experience. I would avoid the over-priced Kindle Oasis 2. The extra inch makes a difference but is still not large enough for PDF reading. For e-books, the extra inch is better for text immersion but is not essential and not worth the Oasis’s price differential. I like the simplicity and features of the Kindle’s PDF software but an Android e-reader, e.g. one of Onyx’s devices, is better and with more options and features for PDF reading. The coupling of Android with extra screen size also makes Android e-readers, to an extent, multi-purpose devices. The Kindle Paperwhite’s flush display is a fingerprint magnet. I own the Kobo Aura One, but it doesn’t have this issue. The fingerprint issue is a negative but not a big problem. In my view, the Kobo Aura One, in comparison to the Kindle Paperwhite 4, has better contrast. The Kindle Paperwhite 4 contrast is acceptable and better than the Kindle Oasis 2. 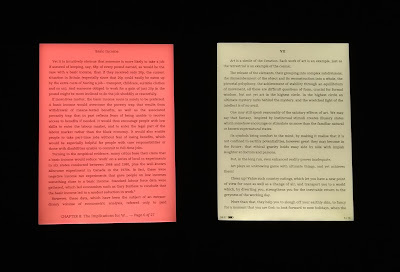 Contrast adjustment, something Boyue and Onyx e-readers support, is an important feature that Amazon's e-readers need to adopt. Kindle e-readers, currently, only support text bolding. Water-proofing, Bluetooth support, expanded storage and an improved front light are all improvements that make the Kindle Paperwhite 4 a better option than the Kindle Oasis 2. As said, the extra inch is now the Oasis 2’s stand-out hardware feature and I don’t think the extra size is worth an extra £110. Processor: The N3050 and N3060 Braswell Celeron processors were poor and struggled with basic tasks, e.g. rendering complex websites, editing larger Google Docs documents and moving between browser tabs. Intel then introduced the Apollo Lake N3350 that improved performance but the processor still struggled to keep up with moderate workloads. The Gemini Lake N4000 goes further than previous generations and offers adequate performance. The ASUS VivoBook E203MA weighs only 0.99 grams - this makes it the lightest laptop in its category. The trackpad is serviceable but is inferior to trackpads you get even with the cheapest Chromebooks. The chiclet keyboard, on the other hand, is positive with its good key travel. Entry-level laptops are designed as mobile devices and usually, in comparison to other laptops, you expect a minimum full day usage from one charge cycle. The ASUS VivoBook E203MA hits the standard but falls short in comparison to HP’s Stream laptops. I found the laptop just goes over the eight-hour of mixed usage when running in battery saving mode and at around 40% screen brightness. Similar to other vendors, ASUS overestimates the battery to ‘up to 10 hours’. HP is known for good audio output and the HP Stream laptops, based on my experience, produce the best audio in this category. The ASUS VivoBook E203MA’s audio does not match HP’s level but is clear and loud enough. Subscriptions: The VivoBook comes with a one-year Office 365 subscription but there is no one-year 1TB OneDrive cloud storage subscription (HP bundles both subscriptions with their HP Stream laptops). The bundled Office 365 subscription is a positive as not all vendors in this category bundle the subscription. Storage & RAM: The VivoBook, following the positive trend in this category, is configured with 4GB RAM. Similarly, keeping with the trend in this category, ASUS decided to keep the 32GB as the default storage option. A 64GB option is available but is restricted, it appears, to North America. The available 32GB storage is workable but you need to constantly monitor storage and select which software package is necessary. The available SD Card slot is useful but is no substitute for internal storage, e.g. Microsoft has not, so far, supported the syncing of OneDrive files to an external storage drive. However, workable is not a good user experience and vendors should up the minimum storage to 64GB. Mediocre glossy screen: The VivoBook E203MA’s screen - a glossy non-IPS panel - is mediocre. It is similar in quality to the HP Stream 14’s glossy screen. Colours and viewing angles are poor and to get optimal viewing it is necessary to set the screen angle to 90 degrees. Tilt the screen slightly and colours shift. I don’t think that the VivoBook being an entry-level laptop justifies ASUS’s screen choice. Acer, for example, fit some of their cheapest Chromebooks with an IPS display. Even the HP Stream 11’s matte non-IPS Screen is more colourful. The ASUS VivoBook E203MA falls short with its screen and limited storage. When vendors decide that an IPS/PLS screen and 64GB storage should be the minimum standard then we will finally get the all-rounder entry-level laptop that gets the basics right. Due to availability, I haven’t tested the N4000 HP Stream 11. However, it is a better choice, considering the previous generation’s screen and excellent battery life, coupled with an improved N4000 processor. I don’t understand why HP decided to restrict its availability to selected countries. One-year Office 365 subscription included. 32GB storage is not enough. Battery life acceptable but could be better.